I’ve been to Friday Night Waltz for over two and a half years, and last night I had the pleasure to DJ the evening, which was awesome. I’ve become notorious for hacking so many pieces that everybody cringes at something or other I’ve done, but fortunately the music tonight was well-received – even the dozen or so new pieces. I have a lot to thank Jason Anderson for that, who is very good at constructive crticism for set lists. Tonight was the last night of Finals Week at Stanford (and apparently also Vintage Invasion) so some of my friends already had Spring Break plans and turnout was not huge (which means more space for dancing, though!). But it was certainly over 100 people, which was pretty cool. Jen was nice enough to drive me over to the venue at 18:00 to test the speaker balance. Unfortunately, it was a bit confusing, and even with Nick’s help I didn’t get a reasonable balance until right before I had to cede the speakers to Cristophe, who was teaching his Waltz for the Moon (from Final Fantasy VIII) choreography lesson. But after that the balance was fine. Whew…. Caroline suggested Waltz for the Moon to me for a waltz a while ago, and it was interesting to see a relatively faithful choreo. No one remembers Chip’s Challenge. Or Cro-Mag Rally. Despite trying to be careful, I once pressed the wrong button, and iTunes advanced to an unexpected song: Never Gonna Give You Up. That’s the third time my computer’s rickrolled me by now. In the category of planned rickrolls, it turns out the drums at the beginning of Never Gonna Give You Up blend pretty well with the beginning of Kerry Sets; everyone went right on dancing! Scott has a metric called the “11:30 retention rate” for measuring how many people stayed because they liked the song. Apparently I did pretty well on that, and I did get a few compliments. So hopefully I’ll get to be back some times this year. It was certainly a lot of fun. Ask Scott to connect the tinny church speakers, and figure out how to adjust the volume *early on* during setup. DJ from the floor instead of the table (although the table looks more impressive). Talk slower and make sure the mic volume / balance reaches the room well. Make it clear to the dancers when a song between sets is an extra song. Aiming for sets of decreasing length is a good idea. Note: Many of the songs I played were significantly different versions/edits from the ones linked here. Why? I might as well learn to touchtype, and Dvorak is a sort of unofficial standard among cubers. led me to Macky’s familiar site. I decided to peruse his Dvorak page. unsure, so I decided to read it. If it didn’t convince me, I would just forget about switching. 20:38:55 <%lgarron> Hmm, keyboard shortcuts are going to be annoying. 20:40:33 <%lgarron> The quick brown fox jumps over the lazy dog. I haven’t looked back. I use “Dvorak – Qwerty ⌘”, which preserves he arrangement of shortcut keys like copy/paste. 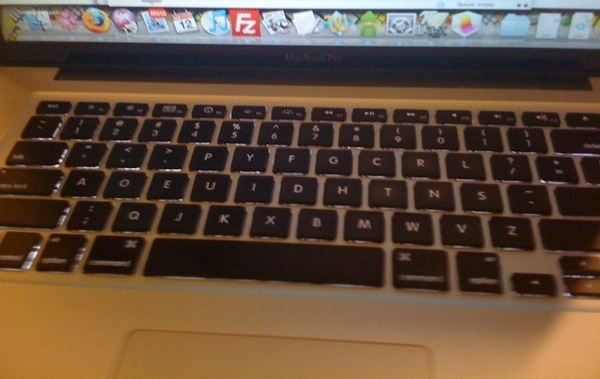 (I began this page as my first blind touch-typing practice). For encouragement, I also got two friends to switch. I almost got sick of typing too slow, but to prevent myself from ever reverting (even temporarily), I decided to switch my keys around physically (see picture). I can now cheat by looking at the keyboard, but at least I can get used to it before I gain actual speed. especially because of frequent learning errors. Most credit definitely goes to the Dvorak Zine for simple, entertaining inspiration. I did not switch because of this thread, nor had I seen the then-current xkcd comic yet.